Not to be confused with Bruno the Great. Bruno was born in Cologne about the year 1030. According to tradition, he belonged to the family of Hartenfaust, or Hardebüst, one of the principal families of the city. Little is known of his early years, except that he studied theology in the present-day French city of Reims before returning to his native land. His Feast day was announced to be October 6th. His education completed, Bruno returned to Cologne, where he was most likely ordained a priest around 1055, and provided with a canonry at St. Cunibert's. In 1056 Bishop Gervais recalled him to Reims, where the following year he found himself head of the Episcopal school, which at the time included the direction of the schools and the oversight of all the educational establishments of the diocese. For eighteen years, from 1057 to 1075, he maintained the prestige which the school of Reims attained under its former masters, Remi of Auxerre, and others. Bruno's first thought on leaving Reims seems to have been to place himself and his companions under the direction of an eminent solitary, Robert of Molesme, who had recently (1075) settled at Sèche-Fontaine, near Molesme in the Roman Catholic Diocese of Langres, together with a band of other hermits, who were later on (in 1098) to form the Cistercians. But he soon found that this was not his vocation. After a short stay he went with six of his companions to Hugh of Châteauneuf, Bishop of Grenoble. The bishop, according to the pious legend, had recently had a vision of these men, under a chaplet of seven stars, and he installed them himself in 1084 in a mountainous and uninhabited spot in the lower Alps of the Dauphiné, in a place named Chartreuse, not far from Grenoble. With St. Bruno were: Landuin, Stephen of Bourg, Stephen of Die (canons of St. Rufus), Hugh the Chaplain and two laymen, Andrew and Guerin, who afterwards became the first lay brothers. At the time, Bruno's pupil, Eudes of Châtillon, had become pope as Urban II (1088). Resolved to continue the work of reform commenced by Gregory VII, and being obliged to struggle against Antipope Clement III and Emperor Henry IV, he was in dire need of competent and devoted allies and called his former master to Rome in 1090. Bruno resisted efforts to name him Archbishop of Reggio Calabria, deferring instead in favor of one of his former pupils nearby in a Benedictine abbey near Salerno. Instead Bruno begged to return again to his solitary life. His intention was to rejoin his brethren in Dauphiné, as a letter addressed to them makes clear. But the will of Urban II kept him in Italy, near the papal court, to which he could be called at need. 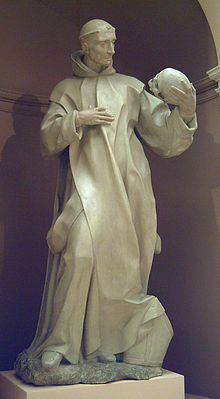 St Bruno, by Manuel Pereira (1652, R.A.B.A.S.F., Madrid). Bruno was buried in the little cemetery of the hermitage of Santa Maria. In 1513, his bones were discovered with the epitaph "Haec sunt ossa magistri Brunonis" (these are the bones of the master Bruno) over them. Since the Carthusian Order maintains a strict observance of humility, Saint Bruno was never formally canonized. He was not included in the Tridentine Calendar, but in the year 1623 Pope Gregory XV included him in the General Roman Calendar for celebration on 6 October. A writer as well as founder of his order, Saint Bruno composed commentaries on the Psalms and on the Epistles of Paul the Apostle. Two letters of his also remain, his profession of faith, and a short elegy on contempt for the world which shows that he cultivated poetry. St Bruno's Commentaries reveal that he knew a little Hebrew and Greek; he was familiar with the Church Fathers, especially Augustine of Hippo and Ambrose. "His style," said Dom Rivet, "is concise, clear, nervous and simple, and his Latin as good as could be expected of that century: it would be difficult to find a composition of this kind at once more solid and more luminous, more concise and more clear." Derry, George H (1913). "St. Bruno (2)" . In Herbermann, Charles (ed.). Catholic Encyclopedia. New York: Robert Appleton Company. "St. Bruno (...) had never been formally canonized. His cult, authorized for the Carthusian Order by Leo X in 1514, was extended to the whole church by Gregory XV, 17 February 1623, as a semi-double feast, and elevated to the class of doubles by Clement X, 14 March 1674." Wikimedia Commons has media related to Bruno of Cologne.